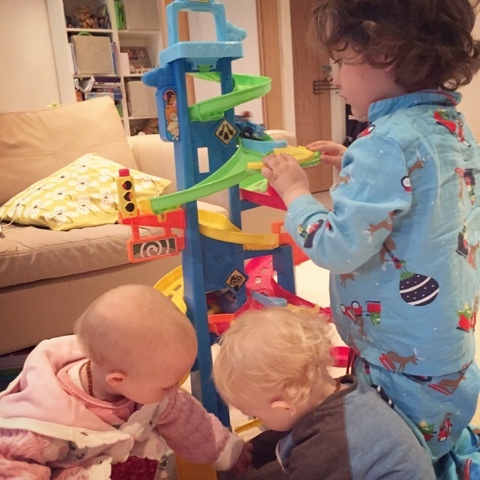 When it comes to toddler toys we love putting them to the test and the Little People Skyway is one that has been a resounding hit in our house both with the twins and Ben. It is aimed at children 18 months to 5 years so perfect for my three and it is one of those toys that they will happily play with together. The Little People Skyway stands over 3 feet tall with one point of entry on top and three exits, one of which includes a jump and always gets a round of applause from Zachary. Ben and the twins love watching and guessing which exit the cars will come out next. There are switches to make cars change paths which you can flip or let happen automatically which adds to the excitement. Ben showed the twins that they could fill up the cars with petrol at the cute little petrol pump that is situated at the base which they love to do, so much so, they often fight over who gets to use the pump. Thankfully it is pretty easy to distract them with some of the other features including the little swinging crane, traffic lights that can be twisted to change colour, parking meter, gates and of course the little cars which are the perfect size for their hands and often get taken in the car with us when we go on the school run because they have become so attached to them. The Little People Skyway has been a huge hit in our house. 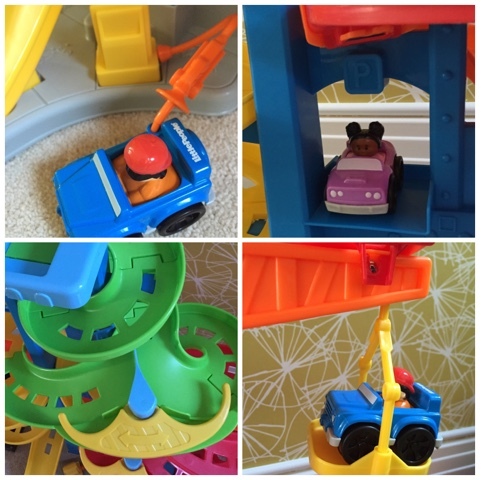 I love the fact that this toy is suitable for Ben and the twins to play with, they each get something different from it and the twins are developing and improving their fine motor skills through doing things such as using the petrol pumps. It is definitely engaging with the three ramps adding to the excitement and there is plenty for all three children to explore. I can definitely recommend this toy for toddlers. *Disclaimer: I received the Little People Skyway for review. All views and opinions are my own and unbiased.